PokerClock.com offers a professional tournament clock that can be used to run practically any tournament. This free web-based tool is fully customizable and can be tweaked in real-time to satisfy the needs of any tournament director, whether you're running a home game among friends or holding an event with thousands of participants. Visit PokerClock.com and run your poker tournament like a pro. PokerClock allows you to save your tournament characteristics, clone them, and store an unlimited number of variables so you don't have to manually create tournaments each time a new one begins. The "live" tournament clock has a very crisp display and can be altered by the click of a mouse to insert an emergency break, pause time, add entrants, or any other function a tournament director might need. The “Prizes” tab allows you to set the payouts by percentage to the top finishers and can be adjusted in real-time as more entrants fill the tournament, while the “Status” tab keeps track of the number of rebuys, add-ons, and players left. These four tabs take care of every practical need a tournament director has when administering the action at the tables. With the click of a mouse, the information can be altered to fit your current needs without interrupting play. The ability of PokerClock.com to make these adjustments in real-time is a huge boost to the playing experience of everyone involved. 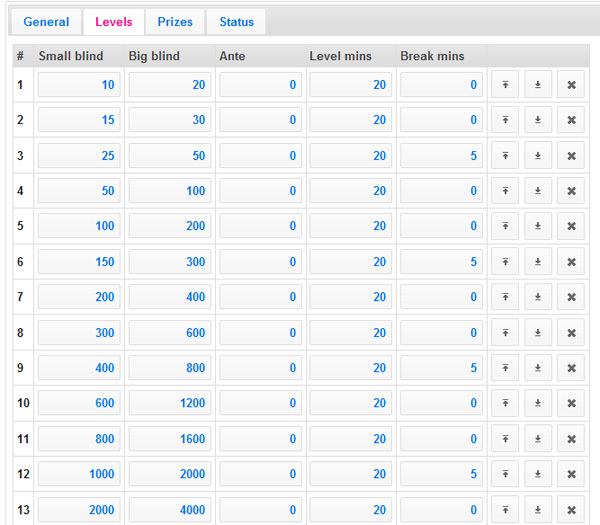 You can quickly add another tournament and set new characteristics in accordance with your needs. The full-featured tournament clock will take care of the rest and can be paused at will. Another nice feature of PokerClock is that it runs on an online server, meaning that it can be attached to several clients, each with their own display. In summary, PokerClock.com provides immense benefits to any person who is running a poker tournament and will immediately enhance your playing experience. Through its clear display, adjustable fields, and customizable characteristics, Poker Clock offers everything a tournament director needs to keep track of the action in one free web-based application. 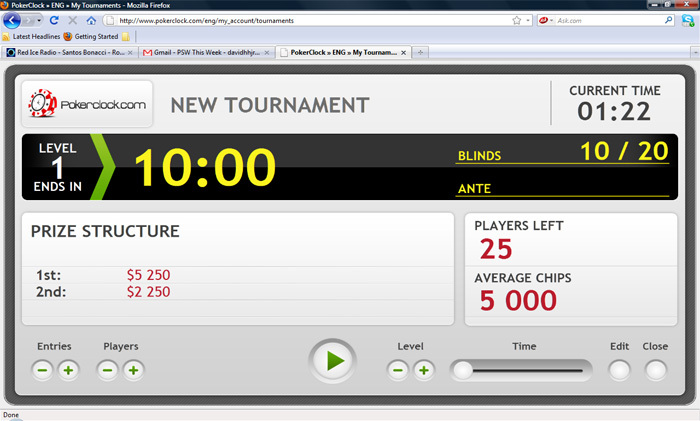 The application can be utilized by visiting PokerClock.com and logging in using your Facebook account for easy access.